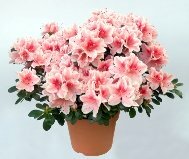 Good azalea care will help your flowers to stay beautiful. You'll find azaleas for sale in florist's shops any time of year, but those colorful blooms are especially popular in the winter when gardens are out of bloom. If your potted azalea just came from the florist or garden center, it likely has a plastic or foil covering over the plastic pot. Remove any wrapping right away so that the drainage holes aren't blocked. Nurseries grow azaleas in small pots to restrict their roots (they bloom best this way), so don't repot your plant. If you want to cover up a plain nursery pot, slip it into a cachepot (a decorative container without drainage holes). I keep pebbles at the bottom of cachepots to keep the pot above the drainage water. This tender blooming house plant, known as florist's azalea, flowers in abundance in shades of pink, white, peach, lavender, red or bi-colored. Azalea flowers are about 1-2 in (2.5-5 cm) across and are often double or semi-double. Some azalea varieties have ruffled petals. Dark-green, oval leaves cover this small, spreading shrub. Its woody stems bear clusters of flowers at their tips. With bright light and cool temperatures, azalea will bloom for about 3-4 weeks. Deadhead flowers. Prune off spent flowers to encourage more blooms and keep your plant looking its best. Make it re-bloom. This tender florist's plant is somewhat challenging to get to rebloom and is often treated as a temporary house plant and tossed out after blooming. It needs about 2 months of cold -- but not freezing -- temperatures (between 40-55°F/4-13°C) in fall or winter to produce buds. Prune your plant. Pruning azaleas will force the stems to branch out, making it a much more attractive plant. Yearly pruning will promote vigorous new growth. Don't be afraid to prune large plants back hard, after flowering. Azaleas produce flowers at the end of new stem tips, so you'll get more flowers this way. Pruning azaleas tip: Cut the stem at a 45° angle, 1/4-inch above a leaf node (the place where a leaf or branch is attached to the stem). Use clean, sharp pruning shears to avoid tearing the woody stems. Protect your azalea plant from drafts. Flower buds may shrivel and turn brown if exposed to the hot, dry air of a heat vent. Add extra humidity with a room humidifier or by placing the plant on a tray of wet pebbles. I wouldn't recommend misting because azalea is prone to fungus, which can kill the plant. Brown leaves are often a symptom of azalea diseases such as fungus or root rot. An infected plant should be discarded because it will not recover. Repot only when necessary, every 3 years or so. Azaleas flower best when slightly pot-bound. Never repot a plant when it's in bloom. Wait till after flowering and use a pot with a drainage hole. Using a clay half-pot -- also called an azalea pot -- is ideal for restricting the plant's roots and also allows good drainage. With good azalea care, this beautiful flowering shrub will dependably produce blooms for many years. Remember -- it's frost-tender. 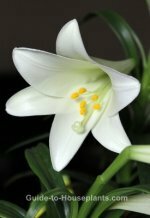 Unlike hardy azaleas that can be grown in the garden, this florist's type cannot withstand freezing temperatures and should not be planted outdoors unless you live where winters are short and mild. 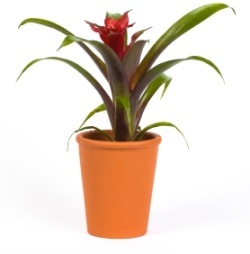 Height: Up to 2 ft (60 cm) as a potted plant. Dwarf azaleas are more compact. Water: Keep soil thoroughly moist. If allowed to dry out, foliage shrivels and flowers wilt. This acid-loving plant shouldn't be watered with hard water. Use rainwater or distilled water. Humidity: Moderate (at least 40% relative humidity) to high humidity. Discover easy ways to increase humidity for your houseplants. Soil: Peat-based (lime free) potting mix. Fertilizer: Fertilizing azaleas during the growing season will keep them healthy and flowering. With azalea care should be taken to use a fertilizer specially made for acid-loving plants. Feed every 2 weeks with a high-potassium fertilizer that contains iron, diluted by half. Yellow leaves with green veins are a sign of a nutrient deficiency caused by too much lime. Propagation: Can be propagated from stem cuttings, although it is slow to root and the results rarely match the quality of the original plant.